Develop a complete multi-modal transportation network for pedestrians, bikes, transit, and automobiles. balance the needs of all forms of transportation. as a primary mode of transportation. option for all City residents. that are safe, comfortable, and easily accessible. MoveDSM is Des Moines’ first citywide transportation planning effort. MoveDSM will establish a multi-modal vision for transportation in Des Moines over the next 25 years. 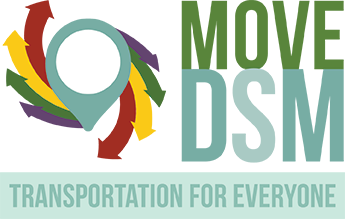 The MoveDSM plan will clearly identify how transportation supports the City’s goals outlined in PlanDSM for safety, quality of life and economic development and ensure that Des Moines is best positioned to provide transportation options for all citizens in every stage of life. Comment on the Proposed Bike Network! Check out our new interactive map, and comment on proposed bike routes around the city. Imagine the Future! Tell us how you think local and national transportation trends will impact Des Moines. Des Moines' first citywide transportation plan! Check-in here throughout the planning process, and stay up to date on events and activities through the SpeakUp Des Moines website. Explore current local and national trends that influence your transportation options today. Tell us how you think these variables will impact the future of Des Moines. Submit questions or comments by filling out the MoveDSM contact form at the bottom of this webpage. Learn more about a new way to think about our streets and what that means for how we move in Des Moines.